It looks like Les and the gang decided to double down on the children’s stories. After giving the music from Charlie and the Chocolate Factory soundtrack the Primus treatment back in 2014, Primus has provided a musical journey based on the children’s book The Rainbow Goblins by Ul de Rico for their current release. 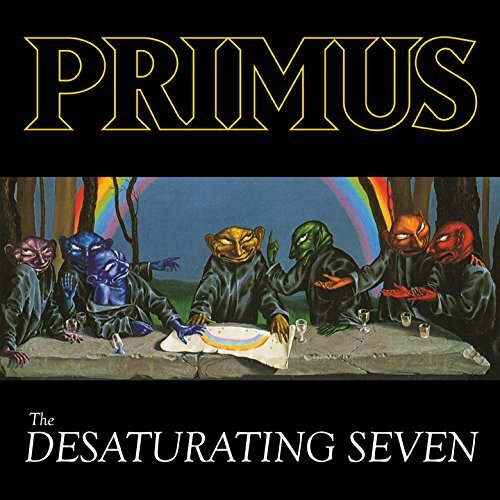 Since Primus has always been the Tim Burton of the alternative metal world, their exploration of these slightly warped children’s tales really comes as no surprise. The current album doesn’t stray very far from what one would expect from a latter-era Primus release. You’ve got your crazy meandering bass lines from Les. You’ve got your random sprinkling of erratic guitar riffs from Mr. LaLonde. You’ve got your downright mastery of Tim Alexander laying down the foundation for the whole enterprise on the drums. You’ve got Les’ vocals sounding more and more Vaudevillian over the years. The songs don’t provide any infectious classics like Tommy the Cat or Jerry Was a Racecar Driver, but there is plenty of innovative playing to keep things interesting throughout. This one is less bombastic than earlier Primus albums which speaks to the age/maturity of the parties involved. This feels more like an introspective Primus than past efforts. Solid, if not always inspired, effort that feels very brief in its 35 minute running time.